And the heat wave in Edmonton continues. Not that I should complain, considering that winter lasts about 6 months where I live.. but really. I feel like I'm over in Asia rather than North America. So. Freaking. Hot. Messy buns & lightweight tops are the only things I live for. Today I wanted to introduce you to Cheeky Thought, which is another awesome accessories shop on Etsy! All the pieces in the shop are handmade, by the owner, Shanna, and I love all the colour and variety of bracelets offered. Everything is lightweight, easy to wear and stack, and Shanna can even customize a piece for you! Shipping is quick, and the packaging is beautiful. Shanna was also so kind to offer all you wonderful readers 15% off your purchase with the code '15OFF' through July 20, 2012 - Whoo! Happy shopping! aren't you just cute as a button! love the back on that top, very cool! This is a great look! I love this outfit, Andrea! The top is so cute and I love your clutch. Don't worry about the heatwave.....you look chic in that summer outfit!! Whoops, totally forgot to list the clutch! I bought it while I was in Hong Kong.. unfortunately I don't know where else to buy it! Hi! thanks for checking out my blog!!! I love yours and this outfit is so cute! 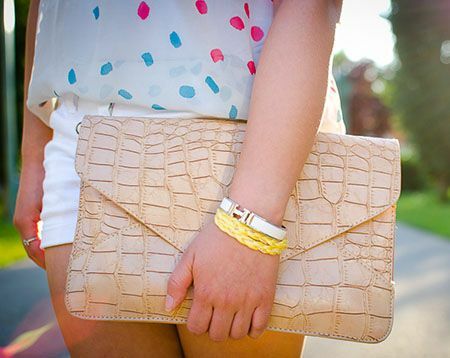 Love your clutch :) !! Andrea, I almost couldn't recognize you! Love the bun! You look so happy too. Yes, it's bloody hot in Vancouver too. I've never bought anything from Etsy, but I will definitely check out the one you recommended. Have an awesome weekend! Oh, two more things. Love your clutch! Where is it from? Also, I just noticed your Hermes bangle too. I want to get one, but I'm still not sure on the color. I really like their signature orange. What would you recommend? Aw thanks Jo! I actually bought it in a little shop while I was in Hong Kong.. I'll scour the web and let you know if I find anything remotely similar! As for the bangle.. I chose to go with white, just because it can pair with absolutely anything. The orange is so pretty though, and classic hermes.. definitely a great pop of colour to go with a neutral outfit! you look so cute andrea! 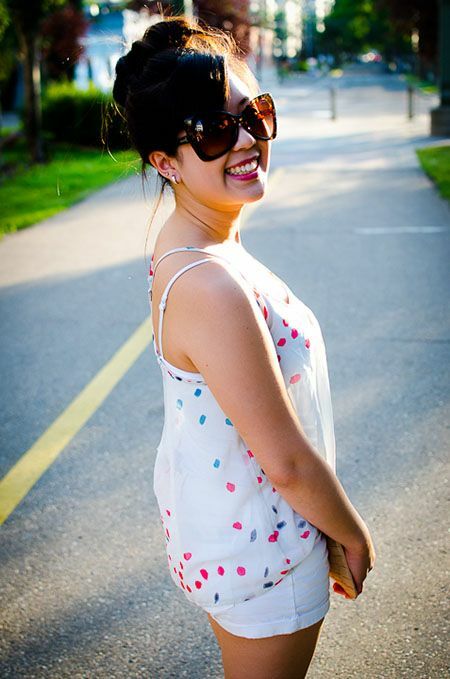 that dot top looks precious on you girl. love the hair up and those are cool sunnies. you go girl! thanks for introducing us to a cool Etsy shop. i love Etsy! have a great weekend. Beautiful top and your hair is too cute! please visit and follow my main site! Love the open back detail of your top! Thanks for the introduction to the shop! Ah, that top is adorable. I love the splatter of polka dots, and the colors are great. Cute top! The dots remind me of confetti the way they're shaped and how they're randomly placed. Very very cute! Hang in there with the hot weather, I'm dying too!! That's a really sweet top! the design of your top looks great, and that clutch really compliments your outfit. also, i just want to thank you for stopping by and leaving a comment on my blog about color blocking. i hope that you have a creative monday! $25 forever 21 giftcard giveaway. This is such a charming look on you. It's been so hot here (over 100) this looks so cool. Manicure Monday: Just Spotted the Lizard!